I’m sure I’m not alone in thinking that my work day is chaotic. There never seems to be enough time, and keeping track of where I’m supposed to be and what I’m supposed to do is difficult. About half my work day is spent in meetings. I’m not as bad as some coworkers whose calendars are booked all day and triple-booked most of the time; very few of my meetings aren’t productive. I’m lucky in that 90 percent of them are related to a project I’m working on. The meeting may not require my active participation, but it’s nice to get a sense for how the project is progressing. Since my calendar isn’t that hard to manage, I just need to need to know where I need to be. Usually, I’ll take a quick look at my calendar before I leave for work. Once I’m at work, I’ll use Exchange reminders to prompt me for my next meeting. The hardest part for me isn’t when I have back-to-back-to-back meetings, it’s when my day has meetings scattered around and only an hour in between them. I just don’t feel like I’m going to make real progress on the work I need to produce those days. My personal calendar is a mix of iCloud and Google Calendars. At some point, splitting them must have made some sense to me – probably a bit of anti-Google pique – but I’m probably going to merge them again. 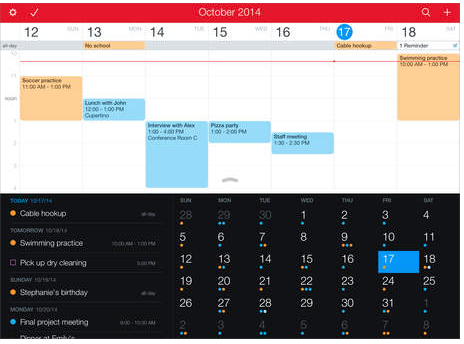 To manage my calendar, I use Fantastical. I find it gives me the best views of my calendar. I love the list view tells me not only what my day looks like, but the next few days as well. If I want to see a graphical view of the disaster my day might be, a quick rotate of my iPhone shows me a traditional calendar view of the next few days. My personal action items can be a bit of a chore to track. I typically know what I need to do on my projects without tracking them, but the harder ones are an unexpected action item in a meeting, or a drive-by. The drive-bys are easy. I’ll just tell the requester to email me what he or she needs done. The unexpected action items I either record in the notes I take for the meeting (which will then go into my iPad tracking system, Things), or I’ll jot it down on a handout and transcribe it. Rarely do I enter it directly into my iPad due to the time and taps it takes to create a task. My personal task list is actually usually longer than my work one. Here I’m tracking ideas for articles, a reminder to send out an invoice, or track a deadline. I don’t typically track household minutia here. I’m not keeping track of changing light bulbs and stuff like that. If there is something I need to take care of when I get home, I will usually use Apple’s Reminders app to, err, remind me. I use Things for managing my tasks. I find OmniFocus to be a little overboard for my needs. I have two projects: Day Job and Freelance and I track all my tasks there. For work projects, I’ll start the name of the task with the project name. Article ideas I’ll start with IDEA, and if it’s a deadline I’m tracking I’ll put the name of the client first. By not having projects for each client and project, I can quickly glance at what I need to focus my efforts on. The only exception to tracking tasks at work are the tasks that require a significant amount of time to resolve. I create a ton of documentation for work, and it’s not uncommon for a document to take between 30 to 40 hours to complete. While I know I need to complete a document, what’s hard is finding the time. To resolve this, I once I have the information I need to create the document, I’ll block off three-to-four-hour chunks of free time in my calendar with the name of the document I’m going to work on. This way, I’ll both get a reminder that I blocked off time to work on it if the day gets away from me, and I show as busy on my calendar. This reduces the chance I’ll have a meeting get booked into that time slot. Sometimes it’s unavoidable if I’m the only person not free at a proposed time, but I’ve found it a workable solution. My calendar and task management system needs to be the most organic of all my workflows. Note taking and managing calendars are fairly easy processes, but I’ve found that managing my action items and isn’t a process I can force myself into. Sometimes, I’ll forget to look at the task app to see what’s upcoming. So, the biggest improvement I’d like to make is to keep the habit of checking Things, as well as entering items directly into the app when I’m assigned it. I also need to make sure I put a due date in the task so I get a reminder when it should be completed. Additionally, I sync my task app which is Todoist… Great for personal tasks and group task as well. I love the reminder based on location… So when I get to work I can get my reminders just for work. 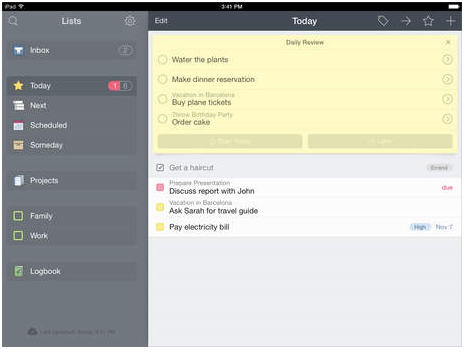 It also integrates with other tasks app such as Amana, Google tasks, producteev, tell. Also nice integration with LinkedIn, useful when you organise meeting with your contacts, you can have a quick view on their profile in LinkedIn. And finally, as a frequent traveller, Triplt completes nicely the overall experience I have with Sunrise…. Hope this can help some of you in deciding what is the best for them. It would be nice if Fantastical and Things would be integrated and you don’t need to do double entries. The Duplicate feature that they ported to Fantastical for iPhone from the OSX Calendar app is tremendously useful, but don’t understand why an iOS 8-only app doesn’t support Travel Time? Thanks for this article. Each of us is certainly on a productivity journey. As a OneNote user who switched to Evernote, I enjoyed your first article on note-taking. I decided to comment on this one because you hit on a pain point I spent much effort to resolve. My day was also about 50% meetings. I went from paper to OneNote on iOS as a partial solution. Loved it! No more reading my terrible handwriting and now my notes were searchable weeks later. One problem. Those darn “unexpected action items” as you call them. Seemed I’d always leave meetings with new work to do. If I left these tasks in my notes, they never made it to my task app. I also entered follow-up meetings that never made it to my calendar. I didn’t take the time switching apps to enter this information immediately and would periodically forget to transfer it later – my inconsistent daily review process to blame I’m sure. I was sure there was a way to connect OneNote directly to my task app to solve this problem. Alas, OneNote was pretty much a closed shop (although they’ve recently announced an API). That led my switch to Evernote in search of “connectivity”. No dice. No way to connect those tasks to my task app or calendar either. By this time, I had Google Calendar, two task apps, OneNote and Evernote running which should sound familiar from your articles. For me, that was a system with too much “overhead”. I tried Zapier and IFTTT, but they worked on whole notes, not tasks. Very long story short, necessity became the mother of invention. Given the nature of your post, don’t think it’s comment spam to share. Until the OneNote API matures, it’s an Evernote-only solution, but it certainly has made life simpler. It’s called TaskClone and hopefully it helps someone. Things, normally $19.99, is the Free App of the Week right now. This article gives me some good ideas for managing and merging tasks, reminders and calendars.